sale 7295, lot 86, 2001. 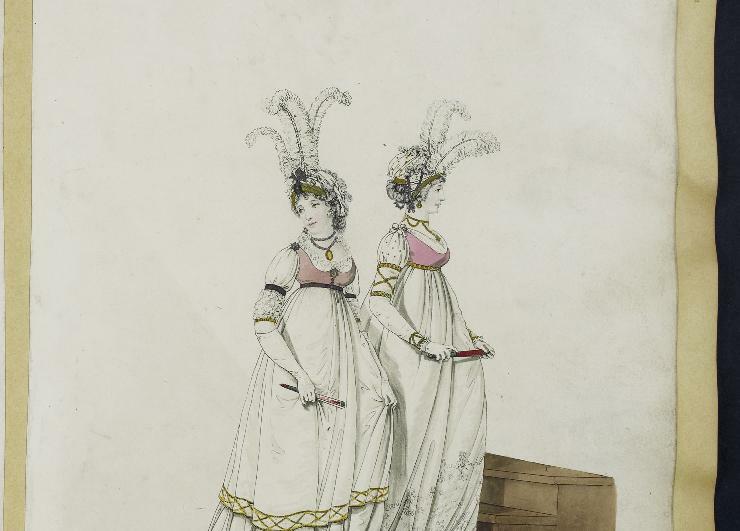 Until last week, if you had asked me about what sorts of fans women of the 1790s and later Regency era had carried, I would have said, oh, they probably were made of paper and were decorated with Classical motifs, or shepherds and shepherdesses a la the middle-eighteenth century. So doing, I’d have given you just a meager spoonful of the airy, colorful world of this trifling but so engaging accessory. Now that I have taken a bigger bite of the subject, I want to taste more, more! I hope you do too, for if there hasn’t lately been a really good exhibition of them mounted, there should be. As always, click on each image to see a larger version. It's a good bet, too, that said fan would feature Rococo curls, shells, swags, and shepherds and shepherdesses billing and cooing along with the doves in the trees around them. The décor and subject matter mirrored that popular in painting, in the decorative arts, and in fashion, just as it usually does. So what were fans like in the 1790s and into the Regency? I took a look at fans in the Boston Museum of Fine Arts, the Metropolitan Museum of Art, the Philadelphia Museum of Art, the Victoria and Albert Museum, and the Costumer's Manifesto. Christie's auction house proved useful, too; for example, their 2001 Fine Fans auction. In most online collections, however, the images are too small to see many details well, or one must enlarge the image in a small window and pan left and right to see much detail, or the fans are partly folded up. Most happily, I found the collection at the British Museum. Here, the images are large enough to see crucial details. I searched for all unmounted fan leaves between 1780-1810, and after trying to view too many hundreds to look within the time I had, narrowed the search to 1795-1802. Best of all, you can order a high-res image from them for many of the images for research purposes, so you can really see the details! in the Collection Maciet, Bibliotheque des Arts Decoratifs. This is what I found. Fans were just as popular. 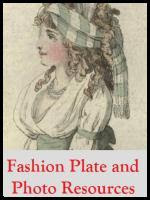 If you look at fashion plates of the Regency era, or paintings, or prints, fans pop up everywhere. I haven't looked at the attitudes the images put their holders in, but have a feeling that how the fan was held and used as a prop changed a bit to reflect changing fashions, mores and physical movement. Purely decoratively speaking and in very broad strokes, by the 1780s fan designers had abandoned Rococo curls and shells for more regular, more Classical designs, designs that you might be familiar with from Sheraton furniture or architectural ornament by the Adams brothers. Light, airy, attenuated, packed with allusions to Classical myth, such designs went well with the light and frothy look of the 1780s and '90s fashions. As the nineteenth century rolled around, purely decorative designs became more bold, more "correctly" Greek or Roman, more serious, at least for awhile, until fluffy tendencies crept back in in the 18-teens, right as frills and furbelows crept back into dress. Neat, eh? These fans are multi-use props, used for far more than wordless communications. I wonder if advances in printing, combined with cheaper paper, and an up-and-coming middle class, made for a big fan market with plenty of scope for printing fans for a whole variety of occasions and uses, from cheap memento or faddish toy, to the "young lady's first fan" to for-best wear. Given the variety of subjects, I can speculate fans and might very well have been sold at tourist venues, fairs, and as commemorative items. Not all fans show the names of the maker, but some do, and there were English and Italian makers among those I saw, who employed designers to make series of fans or at least multiple fan designs in one style. Holler if you have found a good article covering this; it's on the to-do list but I haven't gotten there. Some paper fan leaves appear to have been left in black and white, as part of the design. Others were stipple painted in watercolor, or washed in watercolor. In some cases, the British Museum collection has both a black and white and color version of the same fan design. Just like fans of the middle-eighteenth century, Regency fans did not open out flat, but only to roughly about 95 or 100 degrees. 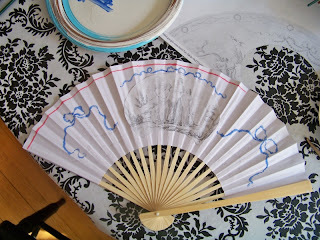 There are a number of resources out there for making or decorating your own fans. The Costumer's Manifesto has a good tutorial called Copying Period Fans. Lauren, the Lady of Portland House, painted her own fans, and did a very pretty job of it, too. For those with cash and a desire for something quite real, Les Tresors d'Aurore by Aurora Walderhaug in Sweden offers gorgeous hand-painted fans mounted on recycled sticks. Thank you, Isis, for the recommendation. Polly paints around her decoupaged image. 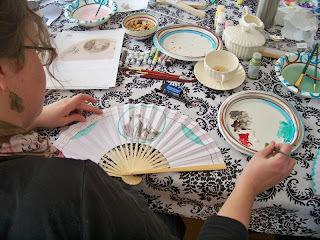 Our little sewing group chose to paint fans, too, just a few weeks ago. First, we browsed a small collection of fan leaves from the British Museum and discussed the themes we saw, and speculated on the fans sources and uses. Then several of us having ordered a high-re image or two and having printed it out, we began to play. First all of us flattened our fans. We pulled them out to their fullest extent, and used our thumbnails to press down the folds so that we could draw, paint, or decoupage on them. On the advice of Kathleen O'Brien, a working artist, we used Golden fluid acrylic paints (1 oz bottles), because, unlike watercolors, they will not soften the glue that holds the paper to the fan. We used Golden Fluid Matte Medium to extend the paints...one drop of color goes a long way. Jenni paints her hand-drawn images. I noted after ordering the paints, but before viewing the British Museum fans up close, that on individual fans, very rarely were more than a few colors used; it appears that the fan painters used the same basic colors over and over. It would be useful to print out a few colored examples, and match them as closely as you can (given variations in photo and printer quality) to your acrylic paints. To affix designs taken from printouts, we used Golden's Fluid Matte Medium, since Kathleen said it works better for decoupage than Modpodge does, as it acts as a glue and is not as sticky when the fan is folded. Polly decoupaged her fan leaf onto a cheap paper fan, painting around the edges to blend the image, which printed smaller than the real fan, in with the rest of the fan. 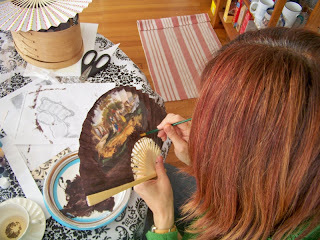 I cut out and applied the central portion of an image, and decoupaged it on the fan. Then I looked at several other fan leaves and drew my own decor, using some of their fanciful bow and garland designs, to surround this central image as if the central image were in a cartouche. Laura and Jenni went further. Each adapted images from fans into their own designs entirely. Kathleen took another tack. She studied the colors used, selected similar colors, and painted abstract designs, resulting in two color-studded fans that remind me of the colors in a Heideloff fashion plate. For more on our fan-painting morning, Jenni has written about the process in her blog post The Sewing Society Paints Fans. A last note: This post is part of The 1790s Project, a research-and-sew-and-play project that our little group started in September 2009, over a year ago. Between Jenni over at Living with Jane and I, we have over well over 20 posts about what we have learned and what we have made. 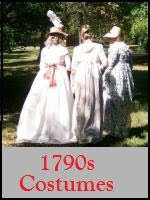 Read my 1790s Project posts. How fun! What a fantastic way to spend a day (no pun intended). And the fans you created are so beautiful! I'd love it if you broke post like this into numerous different posts - it would make it easier to read and find the info later. Fans could be made out of silk! My family have a fan from the late 18th century that is made of painted silk. I can't for my life of it remember where I read this, it's either a letter or a diary from the early 19th century where a lady remembers that the fans where much bigger in her youth, ie before 1790, but now when the are modern women the don't need big fans to hide behind anymore, but to have small and dainty one. Have you seen the fans of Aurora Walderhaug? 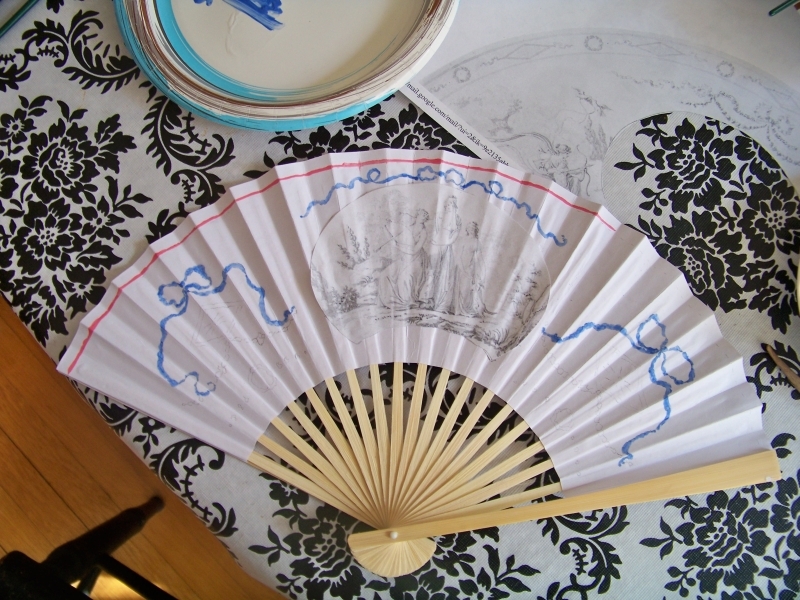 She's an artist who makes both paper and silk fans based on 18th century fans. 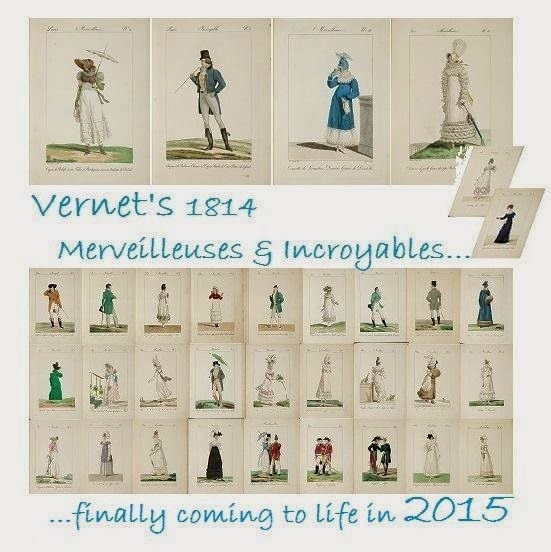 They are extremely pretty and very well made, though her fans are earlier than the 1790's in general. I've heard of her fans but, my goodness, they are prettier even than report. What a treat it would be to have one. Or a snuff box. Perhaps in a few years... I shall edit the post to refer to her site. Many thanks! You're right, the post is too long. I trained as an historian and delight in full explanations. It can be hard to write serially. It could easily have been split into two pieces. Will remember for next time! Any chance you would be interested in posting an image of your family's fan on your blog? It would be cool to see one that is outside of a museum exhibition. Thank you so very much! I hope to be back online and publishing again before too many months are passed.